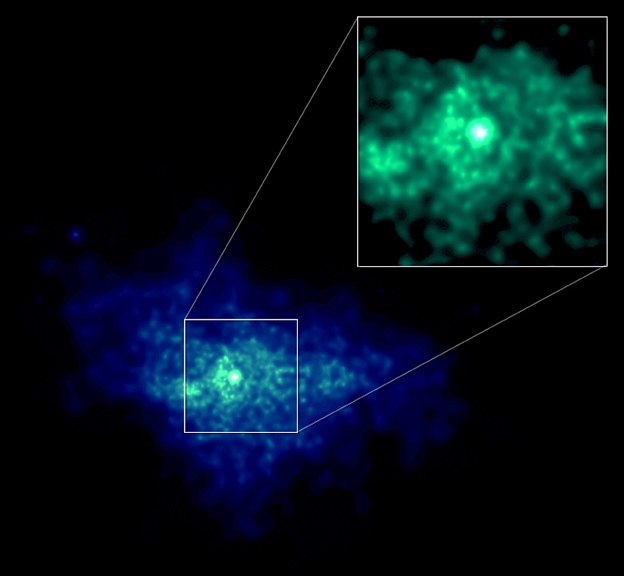 The Chandra image of the distant supernova remnant SNR G54.1+0.3 reveals a bright ring of high-energy particles with a central point-like source. This observation enabled scientists to use the giant Arecibo Radio Telescope to search for and locate the pulsar, or neutron star that powers the ring. The ring of particles and two jet-like structures appear to be due to the energetic flow of radiation and particles from the rapidly spinning neutron star rotating 7 times per second. During the supernova event, the core of a massive star collapsed to form a neutron star that is highly magnetized and creates an enormous electric field as it rotates. The electric field accelerates particles near the neutron star and produces jets blasting away from the poles, and as a disk of matter and anti-matter flowing away from the equator at high speeds. As the equatorial flow rams into the particles and magnetic fields in the nebula, a shock wave forms. The shock wave boosts the particles to extremely high energies causing them to glow in X-rays and produce the bright ring (see inset). 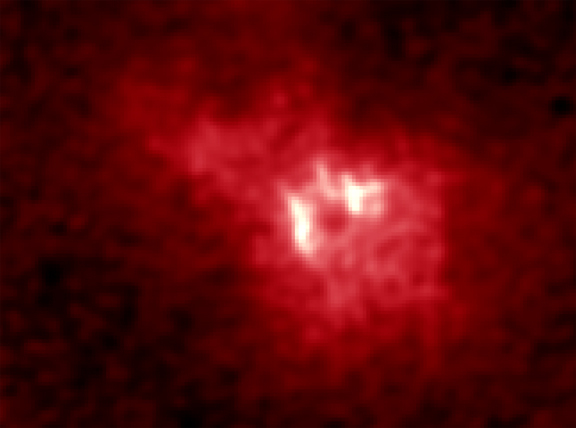 The particles stream outward from the ring and the jets to supply the extended nebula, which spans approximately 6 light years. The features observed in SNR G54.1+0.3 are very similar to other "pulsar wind nebulas" found by Chandra in the Crab Nebula, the Vela supernova remnant, and PSR B1509-58. By analyzing the similarities and differences between these objects, scientists hope to better understand the fascinating process of transforming the rotational energy of the neutron star into high-energy particles with very little frictional heat loss. Coordinates (J2000) RA 19h 30m 30s | Dec +18° 52´ 14"